AIRPLANES Hours and Hours of boredom interrupted by moments of terror. 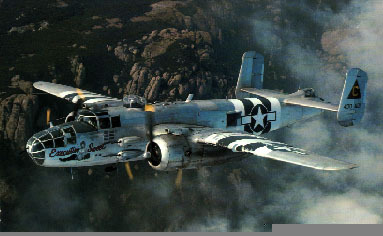 One of my proudest moments was when they painted my name on the side of a B 25 J.
C47, Gooney Bird, VC 117, It had many names. I was the crew chief and flight mechanic on one that looked like this, We called it a VC117, very plush inside with a galley, separate compartments for VIP and passengers. We kept it polished so that you could see your self as if you were looking at a mirror any where on the aircraft. I was assigned to the 7167 Special Air Mission Sqdn. in Frankfurt Germany in the early 50's. The Sqdn. at that time also had C 54's. We took over the courier duties in Europe after M.A.T.S. moved out, with regular flight to about 10 countries. While flying this aircraft I spent three days with Bob Hope on his Christmas tour of Europe and No. Africa and I don't know how many Congressmen, Senators,The Sec. of Defense,The Sec.of Treasury, and Asst. Secretaries I flew with, it seemed like every dept. in Washington had a dozen or more Asst.Sec., also spent two weeks with Shirley Jones and the USO show Oklahoma. 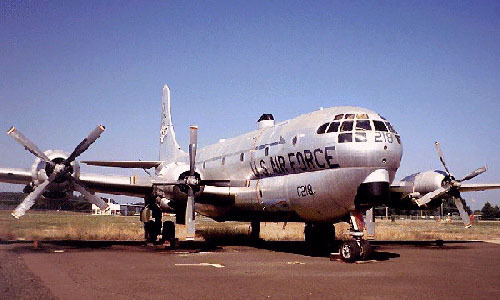 C54, DC4, Skymaster. When Gen.Eisenhower left Europe, Gen. George H Decker replaced him as European Commander. I was walking past our Operations office one day and they ask if I wanted to go to Paris for 30 days, it was a hard decision but I said YES. The trip ended up going all over Europe and the Middle-east. Gen. Decker and his staff were the nicest and the most professional people I had ever met. The airplane required extensive maintenance, but we never missed a take off time. 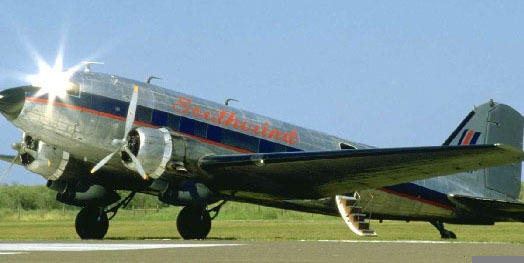 The airplane, 90146, was named the " Sunflower ". It was Gen. Eisenhower's old airplane. It had a picture window, desk with lounge chairs, bunks, complete galley, hot and cold water, shower, back lounge with cocktail bar. After many hours of conversation with Gen. Decker and his chief aid, Marine Major Mahaffy, they offered me the airplane to maintain at Frankfurt, which I did and flew as Gen. Decker's Flight Engineer for the next three years. I traveled to 143 countries while in the SAMS Sqdn. and most of them with Decker and his staff. If anyone knows the where abouts of Mahaffy, email me, please. I'm sure he made General before retiring. 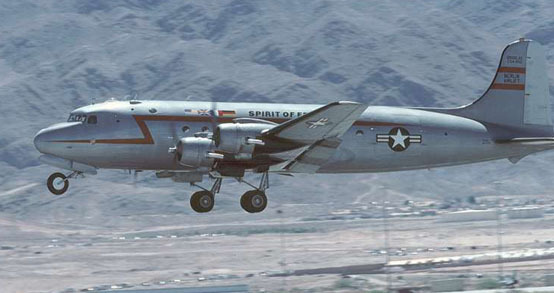 The aircraft was used for many special missions, i.e. V.P. Richard Nixon's aircraft broke down in So. Africa. We picked him up and took him back to the U.S.A. One of my best memories was flying with Gen. Anthony C. McAuliffe, the man that said "Nuts" to Hitler at the Battle of the Bulge. We delivered millions of dollars to Bulgaria in lend lease moneys. A very interesting man. C97, Stratocruiser.. After Germany and Flight Engineers school, it was C97's in the Pacific. I really enjoyed the flights from Calif. to Hawaii, Guam, Wake, Midway, Marshal Islands.etc. then on to Japan. But the next 50 trips got a little old. The Air force gave the aircraft to the National Guard and I found a job in S.A.C. flying C124's. 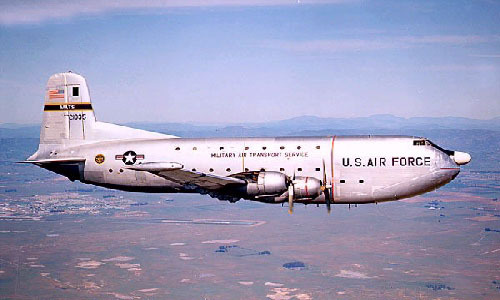 C124c "Old Shakey" I flew as flight engineer on the C124 a & c models for SAC. Our primary mission was transporting Atomic bombs to and from various depot's all over the world. I left the military to fly with Pan Am in the early 60's for almost 4 times the money. Pan Am Engineers went on strike 3 weeks after I went to work. I then went to work as Chief Flt.Eng. for Temco. The T in LTV. Then as a structures engineer on the XB 70, designing repairs on honey cone panels from x-rays while at LTV. Only 3 were built and the project was canceled. A nice picture of the C124C to see it's size and data. Data and History on the B25, C47, C54, C97 and C124. If you are truly an aircraft enthusiast, meet Heinz Zollner.Hz is an flight instructor/flight engineer from Canada. I met Hz through the Net and is the nicest man around. I loved his tune so much, he not only allowed me to steal it he programed it in my computer for me. Thanks Hz. Please take a look at his Home Page.